We are developing an electronic baton system as an alternative haptic interface to facilitate music lessons for the visually impaired. This system incorporates an acceleration sensor in the baton, transmits data to a player via radio signals, and acts as a haptic interface by generating vibrations. In this paper, we experimentally evaluate responses to the stimulus of the visual and the tactile senses in order to verify that a haptic interface can substitute for vision in scenarios that involve real-time tasks, such as music lessons. In the first experiment, we verify that clue motions are important for both the visual and a tactile senses. Next, we test the new method of communicating strength. Thismethod uses not vibration strength but oscillating time for vibrations of the haptic device. The results of the experiment confirm that the technique is effective. T. Asakawa and N. Kawarazaki, “Communication Method of Time Synchronization and Strength Using Haptic Interface,” J. Robot. Mechatron., Vol.26, No.6, pp. 772-779, 2014. 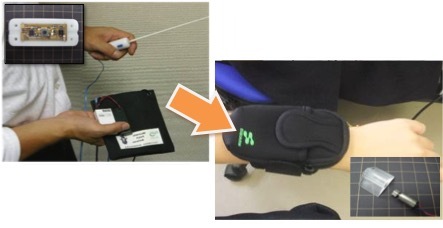 T. Asakawa, N. Saito, N. Kawarazaki, T. Yoshidome, and K. Nishihara, “Development of an Electronic Baton for a Visually Handicapped Person’s Music Study Support,” Proc. of the Welfare Engineering Symposium 2009, pp. 112-113, 2009. T. Asakawa, K. Nishihara, and N. Kawarazaki, “A Music Baton for an Assistance of Visual Handicapped Persons,” The 6th China-Japan Conf. on Mechatronics, Vol.PJ002, No.4, 2010. T. Asakawa and N. Kawarazaki, “An Electric Music Baton System using a Haptic Interface for Visually Disabled Persons,” SICE Annual Conf. 2012 in Akita, Japan, pp. 602-607, 2012. T. Asakawa and N. Kawarazaki, “Providing Support for the Visually Disabled using a Haptic Interface,” The 23th Biomechanism Symposium, pp. 187-196, 2013. A. Hiraiwa, M. Fukumoto, and T. Uchiyama, “The display of conductor baton operation for blind persons,” PAT No.3362496 in Japan, 2002. S. Ito, K. Kotani, and K. Horii, “A Measurement of Differential Limen of Force for Haptic-Interface,” HUMAN Interface, Vol.7, No.2, pp. 21-24, 2005. A. G. Dodds, D. Clark, and C. I. Howarth, “The effects of precueing on vibrotactile reaction times: Implications for guidance device for blind people,” Ergonomics, Vol.29, No.9, pp. 1063-1071, 1986. Y. Mori, T. Tanaka, and S. Kaneko, “Vibration Alert Interface for Detecting Surroundings,” Third Asia Int. Symposium on Mechatronics, Vol.FA1-1, No.3, 2008. M. Shimojo, “The View of Tactile Sensing Technology,” J. of the Society of Instrument and Control Engineers, Vol.47, No.7, pp. 548-553, 2008. H. Ogawa and M. Shimojo, “Development of 2-DOF Haptic Device Driven Directly by Shaft Motors,” J. of Robotics and Mechatronics, Vol.18, No.4, pp. 392-400, 2006. Y. Saita, “Hajimeteno Shikihou,” Ongaku no Tomo Sya, 2009 (in Japanese). M. I. Posner, “Orienting of attention,” Quarterly J. of Experimental Psychology, Vol.32, pp. 3-25, 1980. M. I. Posner and M. E. Raichle, “Images of Mind. Scientific American Library,” W. H. Freeman and Company, New York, 1994. M. I. Posner, “Attention networks,” Trends in Neuroscience, Vol.17, pp. 75-79, 1994.